If there is one thing I love, it’s a musical! I think every film should have a musical number or two or fourteen…preferably fourteen. I think people should burst into song in their everyday lives. I think those wonderful flash mobs should be a regular occurrence. The world is so much more magnificent with a bit of music. Honestly, I don’t think there is a musical that I’ve seen that I disliked. I was lucky enough to regularly go to the theater as I was brought up. This is rather exceptional, since I live in Iowa, but Des Moines gets its fair share of good touring Broadway shows. Growing up, I saw: The Sound of Music, Peter Pan, Oliver, Beauty and the Beast, The Producers, Titanic, The Phantom of the Opera, Wicked, Annie, Grease, Avenue Q, Young Frankenstein, and several others that I’ve forgotten. I adore them. I live for them. I listen to musical soundtracks like other people listen to the radio. If you asked, I could put on a one-man show of any of the following: Evita, Sunset Boulevard, or Sweeney Todd. In high school, my best friend and I forced the guidance counselors to give us a band internship. We had our own office in the attic of the school with a massive table and all the free time we wanted. It’s a miracle we graduated. We wrote hilariously bad one-act plays and sang the entire score to Sweeney Todd. I recall still with great fondness the afternoon we practiced hitting B flat for the entire day. There’s nothing better than singing along to a musical. 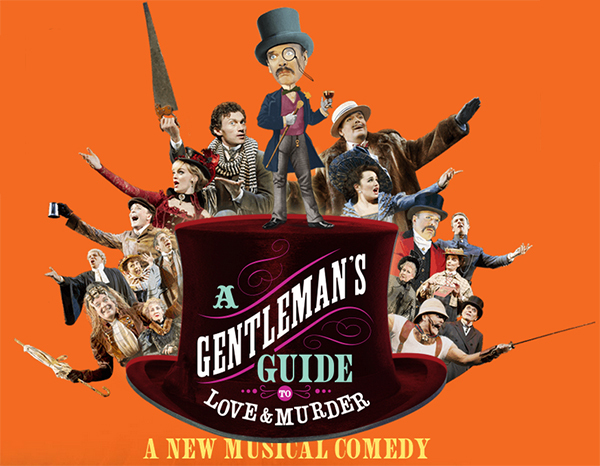 When I go to New York in March, I’ve got tickets to A Gentleman’s Guide to Love & Murder, which is a musical comedy about a serial killer! What fun! It’s going to be amazing, I already have some of the songs stuck in my head. You know how I’m obsessed with French fries, right? They’re basically the best food in the entire world. I could eat them everyday. I would do so happily. 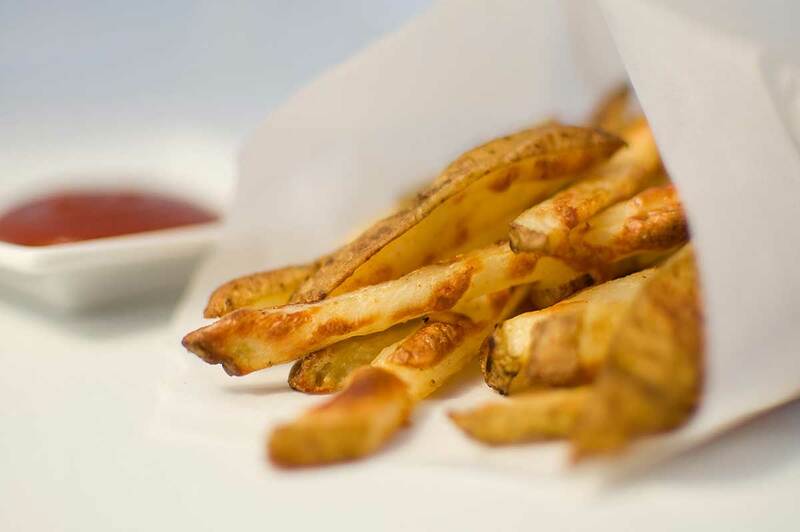 I don’t fry my French fries because oil — gross — so I bake them instead, which is good, but some of the fries are limp. Martha gave me a tip, though, if you parboil the cut potatoes for a few minutes and then bake them, they turn crisp and wonderful. Last night I made a batch of potato wedges and I don’t think they’ve ever been better. I highly recommend you all follow this procedure immediately: 1) Cut potato into desired shape. 2) Place in pan, cover with salted water, bring to boill for five minutes. 3) Strain and run cool water over potatoes to stop cooking. 4) Toss with olive oil and spices. 5) Bake in a preheated 425 degree oven for fifteen minutes, flip, bake for another ten minutes. 6) Broil to desired crispness. 7) Gorge. 8) Repeat. 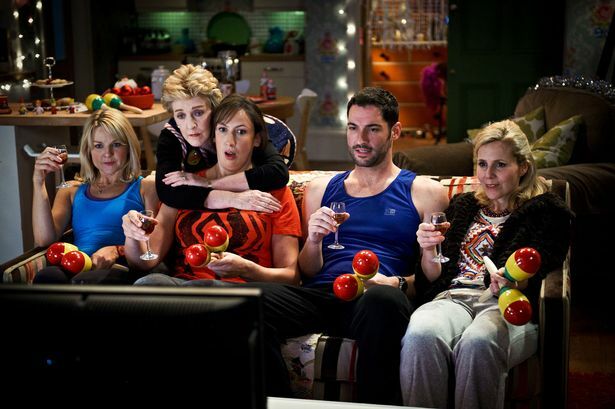 Miranda is one of the greatest shows to come from England in the new millenium. I don’t know where to begin my compliments! Surely I’ve written them down before. I decided to introduce my sister to the many hilarious charms of this series and in doing so have watched the entire thing over again. Not a terribly difficult task since the British only have six to ten episode per season. Very civilized that. You don’t have to drag a story on for half a year like we do here. That is too exhausting. Miranda Hart, the comedic star, is a goddess that ranks up there with the likes of Jennifer Saunders and Dawn French in my mind. Her awkwardness and timing are exceptional and the acting itself — even though it is a comedy — is top notch. I feel more anguish in her seemingly doomed relationship with her good friend, Gary, than when Rose lets Jack go. (Still not over that.) The program is very foolishly not on Netflix, but oddly on Hulu, where you should proceed immediately and catch up. It’s absolutely perfection. Such fun! I effing love beets. I never thought that I would, but I do. It’s ridiculous. I still recall the terror that consumed me the very first time they were presented to me — beet salad, three ways (pickled, raw, and oddly in marshmallow form) — oh, reader, I wanted to die. But, I took a bite and it changed me. They were so earthy and full of flavor and delicious. Ever since then, I haven’t been able to get enough beets. I want them all the time. They’re absolutely at their best in salads covered with goat cheese and layered with arugula. Heaven. I had one last night at the Hotel Pattee here in Perry and while it wasn’t the most thrilling beet salad I’ve ever had (that prize goes to Proof in Des Moines), it was certainly satisfying and I’d gladly have another one right now. I wish they delivered. I’d like one for lunch. 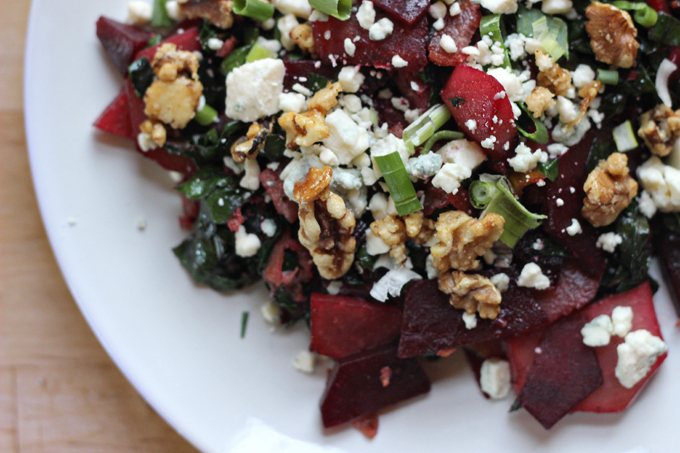 There’s no way I could eat an entire beet salad in the time I have for luncheon, though. Why isn’t America more like France when it comes to food appreciation? 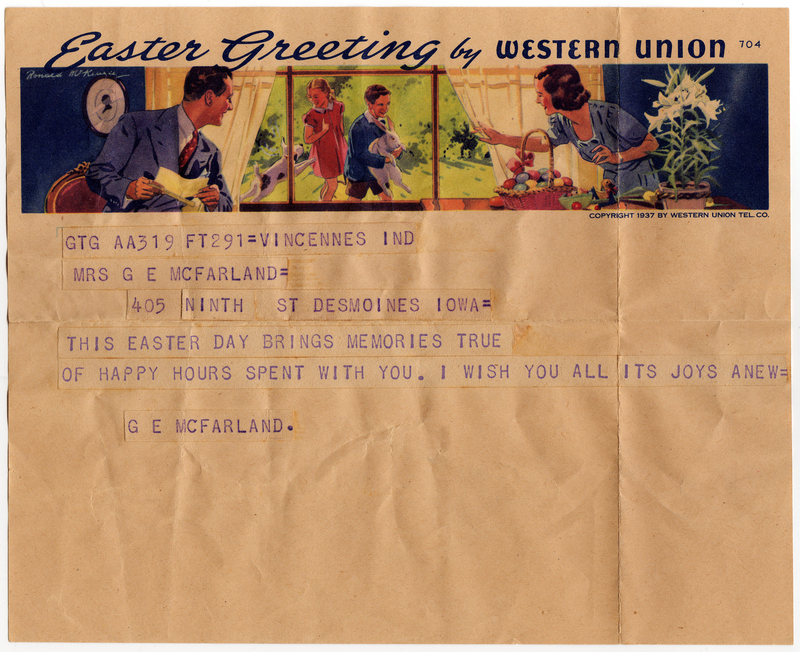 There, in that wondrous country, they give their people time to enjoy a meal. Here, we just have to quickly scarf down whatever we can manage in about twenty minutes, hoping it will give us temporary abatement from the overwhelming hunger that gnaws on us until we get home and can gorge on everything. EVERYTHING. Anyway, beets are pretty great and I think I’m going to pop some in the garden this year. I have always said and believed that people should enjoy whatever it is they enjoy. Why waste time judging others when you can work on making your life as exciting and interesting as can be? I’ve adored Miley for ages. I enjoyed Hannah Montana, I won’t lie; whenever Dolly Parton showed up, I just died. I find it odd that Dolly and I have never crossed paths. Growing up, I was constantly surrounded by country stars and legends. (I’ve had a weird life.) I think I’m going to see her this summer, though, in London, and I’m probably going to just drop dead. Picture it: me, Dolly, London, “Jolene.” Too much, it’s too much! Anyway, the other night, Miley did a session of Unplugged on MTV and it was excellent. Her vocals were spot on, the show was well executed, she had an intriguing set, and she sang with Madonna. What more could you want out of life? I thought it was excellent. I was particularly enamored of her platinum blonde hair she had in the costume change after the pictured one. It was so beautiful! It was like a younger Gwen Stefani. I thought the concert was the epitome of a good time. Stupidly, I read some reviews today by very well-respected publications, and I could not be more ashamed to live in the modern world. People were tearing her down and just full of critiques. Even my friends insulted her. (I rarely see them on MTV performing for massive audiences, mind you. Oh yes, I’ve never seen them on MTV performing for massive audiences.) I don’t have time for this. If you don’t like something, get on with your life and have fun with what brings you pleasure, don’t demean the interests of others — that’s idiotic and cruel. At work, I am often presented with…rather intense fans of Justin Bieber. I don’t care for the guy myself, but I would never ever demean him. Maybe I just have manners? A lot of people don’t have manners. That’s unimportant. Miley is going to be with us for a long time, I have the feeling that she is one of the acts that is going to stick around and develop like a fine wine. Good on you, Miley. I’ve long chronicled my sleeping troubles for your reading pleasure — I assume you enjoy the misery of my insomnia and my elaborate retellings of the many naps I take. I hate sleeping. I love naps, but I hate sleeping. 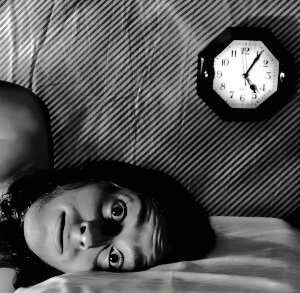 There’s nothing worse than having to lie down and force yourself to shut down. This is something I’m utterly incapable of. I am the most productive in the evenings. Nighttime is when I want to accomplish all of my work and tasks. If I could choose to live in a world of my own design, the hours would be flipped around. I love daylight and all, but I don’t want to work in it. It distracts me. So, since my brain only really gets going around eight o’clock, it’s nearly impossible for me to sleep at midnight, and I generally stay up until two…sometimes three. Of course, my work begins at an unreasonable hour in the morning (truly, who’s great idea was it to start education at eight in the morning? ), so I’m soon back up. I’d love to get up, stretch luxuriantly, drink a pot of tea as I go through my emails and then leisurely dress myself. Instead, I hit the snooze button four hundred times, leap from bed into whatever outfit I’ve laid out and pray that my hair won’t be a total disaster. It is today. I got ready in ten minutes! Sadly, that’s no record. I’m not going to try to fix this rhythm, since I’ve tried for years to no avail, it’s just how my body works, I guess. Guys, I’m unbelievably cold. 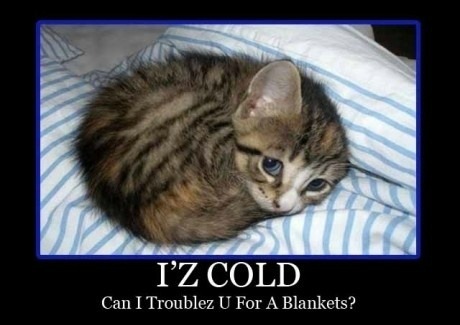 Like, I can’t even describe how cold it is. It doesn’t snow here much anymore, it’s just constantly frigid. Like, I assume this is how Antarctica feels. The other day I was reading that Iowa was currently colder than the surface of Mars. MARS! How is that even possible? Why have you forsaken me, GLOBAL WARMING? Last night, I couldn’t sleep because it was so cold. I had the space heater cranked and I was burrowed under blankets and Edna was on top of me, but still, no luck. All I could do was shiver and shiver and shiver. It’s awful. Godawful. Work has been delayed and even cancelled due to the weather. My cousin in Wisconsin barely goes to school anymore. The entire country is an icebox. For the past few years, winter hasn’t been that dreadful. I have gone for walks on New Year’s Day in the past. Not anymore. This has rekindled my desire to move to Florida. It might have to happen even sooner than I thought. I can’t bear it. I just can’t bear it. My body isn’t meant to be swaddled up in sweaters each day. I’m designed to wear short shorts and tank tops and have a bronze glow and sun-bleached hair. ARGH. I have been a fan of this series ever since it began — mainly because I think the concept of the show was stolen from me. I’ve belabored this point often in the past, I shan’t get into it again here… Anyway, this last season hasn’t been my favorite in terms of story and plot, but it was eminently beautiful. Each season has been designed very well, but this was was a true sensation. I am crazily in love with the manor that houses the Coven with all its perfectly white walls, light colored floors, the rich oil paintings, the brassy touches, the ceilings with their multiple designs, the wrought iron outside, the conservatory…again, all of this straight out of my first novel, Terrible Miss Margo. It was gorgeous to look at and I will miss the sets more than anything else. I wasn’t crazy about the story this year because it did not feel like a cohesive oeuvre, mainly just a bunch of fun ideas thrown together without an apparent sense of how they were all coming together (which they didn’t always do). I didn’t appreciate this. I did appreciate the cast as always, since Jessica Lange is a goddess amongst us and one of the few woman who could handle the role of Margo in the cinematic adaptation of my first novel, Terrible Miss Margo. (Dear Editors of the World, PLEASE REPRESENT MY BOOK. Don’t you dare make me self publish!) 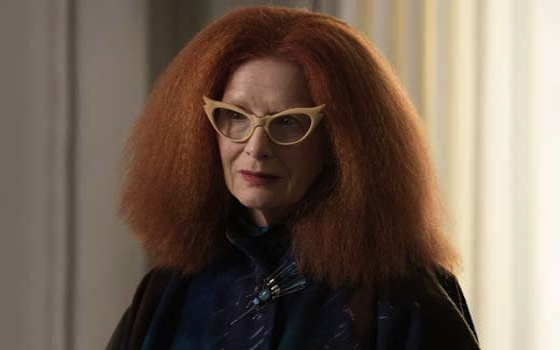 Also, the true triumph of this season was Myrtle, played by Frances Conroy, who looked like an over-the-top version of Grace Coddington. If you don’t know who she is, shame on you. For your punishment, I insist you order her delightful memoir and binge read it in one setting. It won’t be hard, you’ll be engrossed. And now, the season is over — thankfully, almost, it was getting exhausting — and we have to wait for the next one. Rumors are circulating about circuses. I don’t know about this. I’ve never written anything about circuses, so I don’t know how they will do it. [UPDATE: circuses have been confirmed as nothing but a rumor! HA! Like I said. It’ll probably have to do with immortal siblings who were friends with Oscar Wilde. Just wait. Have you read my reasonably priced novella, available now on the Amazon Kindle shop?] Also, Jessica Lange allegedly has to have a German accent and this thrills and delights me. Will she be a Nazi? I hope she’s a Nazi. I’m not going to say a lot here because I’m surely going to collapse into a weeping heap at any moment. Colonel Meow has died and it’s been very difficult for me. I willingly admit that death does not bother me. When people die, I blink a couple times and move on. I have no worry about the afterlife or the supposed meanings of life. I’m just here to enjoy myself and marry Tom Daley, Zac Efron, Harry Styles, and then Zayn Malik. So, yes, enjoying myself tremendously. But, when animals die, I’m a wreck. They mean so much more than people. Animals are kind and sweet and nonjudgmental. Animals are what humans should strive to be more like. 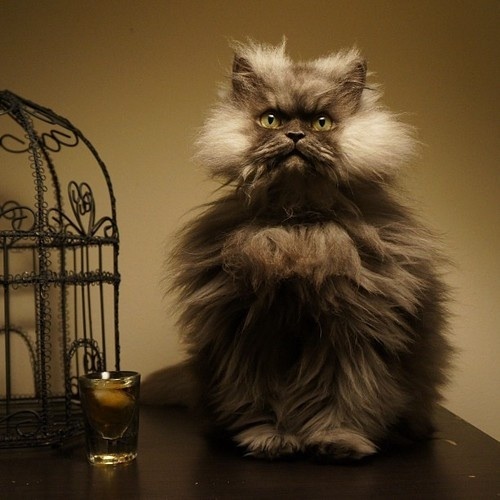 I never knew Colonel Meow, obviously, but I was absolutely charmed by his fur and his persona and his Tumblr. He was a cat, he didn’t write his Tumblr posts…but that didn’t make it any less adorable or charming. I think it’s a great tragedy that he’s left us. I’m sure he’s happy and fine now in whatever realm he’s in. He had a happy life. There’s no reason to be sad, but I just can’t help it. It’s a very selfish thing, grieving, since it’s only about the sadness you feel personally that makes you miss the person. It’s the same with love. The best part of being in love is the way you feel. When a relationship or whatever fails, you don’t always miss the person, you just miss the way they made you feel. I’m going to miss the way Colonel Meow made me feel.